Scientific Name(s): Centaurea benedicta (L.) L.
Photographer(s) Appreciation: This is another excellent photograph contributed to BPotD by Monceau@Flickr (via the Botany Photo of the Day Flickr Pool). Daniel recently wrote about Quercus robur, but it’s been some time since I wrote about a species native to Europe, so today I’ve chosen Centaurea benedicta (formerly Cnicus benedictus) as the topic. 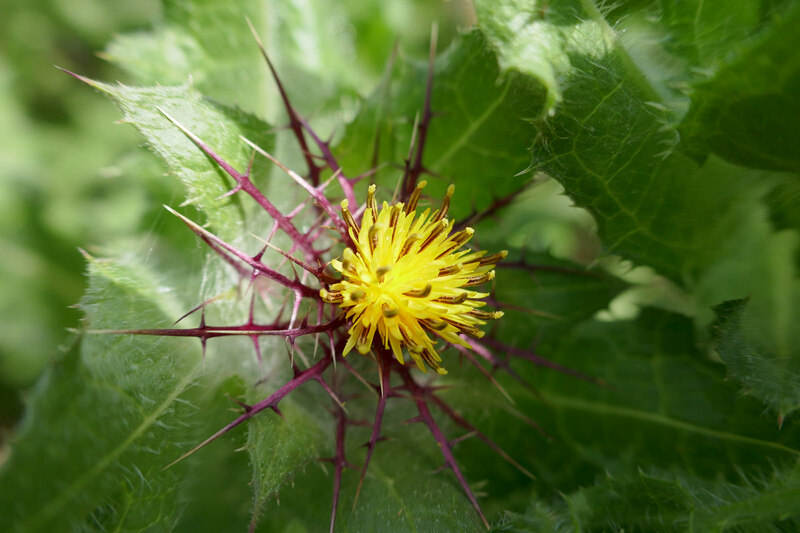 Perhaps best known (in English) as blessed thistle, its importance as a historical medicine makes an interesting contrast with the widespread notion of it as an invasive weed (where it has been introduced). A member of the Asteraceae, the genus Centaurea contains approximately 250 species. According to Pliny, the medicinal properties of this genus were discovered by Chiron, a mythical centaur. The specific epithet benedicta is derived from Latin, meaning “to be blessed”. The informal term “thistle” could be applied specifically to species in the genus Cirsium, but it is also used for a number of related species in the Asteraceae with spinose leaves and leaf-like organs. Wikipedia describes Centaurea benedicta as “thistle-like”, as it only somewhat shares the appearance of the typical purple-flowered thistle. Another example of a Cirsium relative is milk thistle, featured on Botany Photo of the Day in 2006. Always be cautious with common names (and thistles, for that matter)! As shown in today’s photo, the yellow inflorescences of the summer-blooming blessed thistle are at the apex of stems. Subtending these flowering heads are a set of spiny pinnatifid phyllaries. Like many (all?) other species of Centaurea, Centaurea benedicta is a species of sunny, dry environments. Blessed thistle is native to the centre of diversity for the genus, the Mediterranean region of Europe. Its native range extends eastward to Iran. Like many other species, it now occurs in areas of the world where it isn’t native. At these locations, it is often considered a noxious weed (see its appearance in the Flora of North America and Flora of China as examples of its non-native range). Mediterranean-type ecosystems, such as those where Centaurea benedicta natively occurs, are extremely biodiverse areas that recall fond memories from the countless hours I’ve spent roaming their dry scrublands watching birds. According to the IUCN, the total vascular plant flora of Mediterranean-Type Ecosystems accounts for roughly 20% of the world’s plant species, yet only covers just over 2% of the Earth’s terrestrial surface. These ecosystems are widely dispersed, occurring in southwestern and southern Australia, central Chile, California and northern Baja California, the Western Cape of South Africa, and of course, the namesake lands surrounding the Mediterranean Sea. All are designated as biodiversity hotspots. Throughout the middle ages, blessed thistle was popularly seen as a cure-all treatment for diseases, including the plague, measles, and smallpox. The use of the name “blessed” likely comes from its reputation as a medicinal panacea. A nearly endless list of its medicinal properties includes astringent, diuretic, antibiotic, and expectorant. It was also used for increasing blood circulation, relieving pain, and treating wounds or skin conditions. The aboveground parts of the plant were typically sourced for medicine, but the roots can also apparently be boiled and eaten. Matthiolus, a sixteenth century doctor and naturalist, purportedly wrote “there is hardly a better medication for cancer and other rotting damage” when referring to the blessed thistle…however this does lacks a reliable source. Shakespeare also made a mention of blessed thistle in his comedy Much Ado About Nothing, where it’s recommended as a herbal remedy. The Met Museum has an excellent page that dives into the medieval history of this plant. Its use as a remedy persists in modern times as a tea or tincture. I just want to say, that I look at your Photo of the Day in my inbox with a happy heart. This is because nature is of God and never unfriendly, critical, or bad news. It is just an uplifting joy to behold. Thank you for the lift to my spirit that your picture posts bring. I rarely read the wonderful texts, but I do receive invaluable benefits from looking at the natural beautiful sites that are captured in pictures. God must be grateful to you for bringing the beauty of His creation to the eyes of mere mortals as I. A subtle firework of a flower! A beautiful image and well-written text. The information about Mediterranean ecosystem diversity, and where the ecosystem occurs around the world, is interesting to know. And I love the phrase, “a set of spiny pinnatifid phyllaries.” Somehow, even if you don’t know the meaning of the words themselves, the sound mimics the look of what is being described. Centaurea is a genus within the family Asteraceae (Sunflower family), the largest family of flowering plants, has a cosmopolitan distribution (except Antarctica).and a fossil record stretching back at least 47.5 million years. The fossil record includes pollen grains and some nice fossil impressions of whole plants from NW Patagonia, in Argentina. The uniques flower structure may be responsible for its adaptive radiation into many different habitats and niches worldwide, and species diversification into an astounding 27,000 species, from annuals to trees. The family apparently evolved in South America following the breakup of the ancient continent Gondwana.